When babies are brand new, we talk about how old they are in days, then weeks, then months. Eventually, we move on to years and halves. I have an 8 ½-year-old son. I had an 11 ½-year-old son. That organizing of time seems to be happening in death as well. Right after Riley died, it was, how did he die four days ago? Then, how did he die two weeks ago? And when I started writing this, on the 20th of the month, I wondered how it could be that he had been dead for three months. How do I keep living when he is not? The months keep piling up without him. A weeklong retreat to the Big Island earlier this month gave my aimlessness shelter. While being aimless at home feels like laziness, being aimless in Hawaii with close friends felt natural. So many people are on vacation and being aimless is often the point of being on vacation. An entire day was spent in a cabana crying and laughing, the ebbs and tears flowing and retreating like the water pushing forward along the sand and then receding into its own vastness. Emotions rode that surf as it gently tapped shore and simultaneously pounded the rocks 300 feet offshore. They were both of those things at the same time, not unlike when I can laugh and then instantly feel pummeled by the waves of grief pushing me under every time I notice his absence, which is constantly. 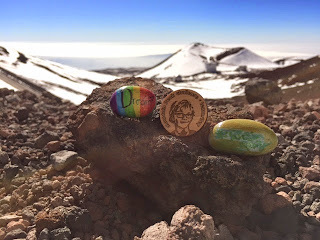 One day we ventured to the highest peak in Hawaii, Mauna Kea. There were snow-covered rock faces and thin air. The elevation changed our breathing and made our motions slightly slower. Being there was profoundly beautiful, yet ordinary for most humans with healthy anatomies. I felt lightheaded and heavy-hearted. I had avoided elevation most of Riley’s life. How could I go to elevation when he could not? Yet there we were on the top of that mountain for Riley. At the Celebration of Riley's life, a friend distributed wooden token that he had had made. One side says, Climb a mountain in Riley's memory. The other side has a picture of Riley's likeness. 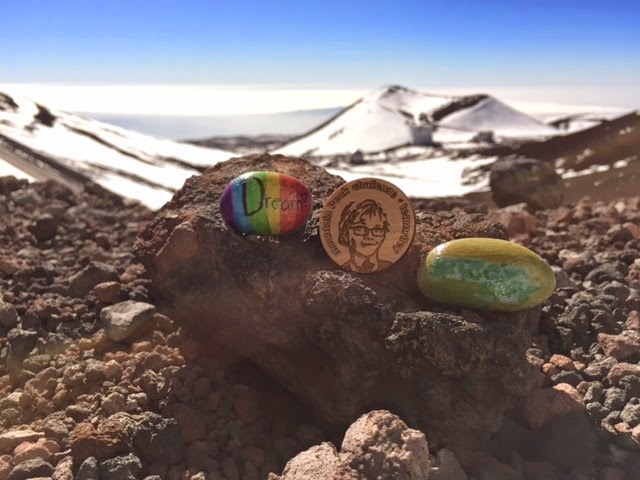 We honored Riley on that mountaintop and reflected on all that has happened from that new perspective. Two of my kids had painted stones to leave there. The idea was that we could discover them during a future visit. The perfect hiding spot was under a large volcanic boulder with a bit carved out on one side. I pushed the stones in and covered them with rocks. The process of burying those stones was surprisingly painful. Leaving them behind felt like abandoning Riley alone in the cold, thin air. It was like I left pieces of him unprotected to endure the elements without me looking out for him, without me taking care of him. No, the stones aren't actually my son, but the symbolism was not lost on me. Returning to my Northern Californian town was unsettling. Being aimless here feels much less acceptable. There are routines and schedules and lunches to make, days to endure, weeks to pass. And soon enough the 20th of the month will reappear. Every single month, round and round we go, the accumulation of life without him. Eventually October will come around and stab me with each of its passing days. One year, then two, and then somehow my 8 ½-year-old son will surpass my 11-and-a-half-year-old son in age and the younger brother will become the older brother.